G3B Gas Burner – Carlin Combustion Technology, Inc. The G3B is a power gas burner for natural or propane gas completely assembled, using premix combustion and hot surface ignition with flame rectification flame sensing. 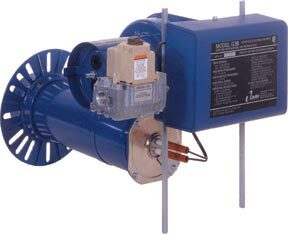 Converts from propane to natural gas with just an orifice change no conversion kit needed. Simple adjustments of the air shutter and combustion head, set with Carlin’s easy-access screw adjustment. Blower access cover allows full view of blower compartment. Burners use the same air handling parts for all firing rates. Burners use standard components, including Carlin electronic ignitor and standard primary controls. Jacob’s ladder electrode tips for wide spark pattern and reliable ignition. Low-high-low step modulation, using low-and high-fire oil valves and nozzles and butterfly gas valve with motorized air damper. Requires high fire control on boiler by others. Positive ignition, stable operation, and compact flame. Gas pilot ignition for gas/spark ignition for oil. Compact flame for maximum versatility. Insensitive to draft or moderate back-pressure variations. Can operate in forced draft applications up to 0.60 inches w.c. positive overfire pressure. Excellent performance when tested in appliances that do not use refractory combution chambers.